If you can ride a bicycle, you can ride a Trailkat! Discover the fun places your feet or a bicycle can't take you. 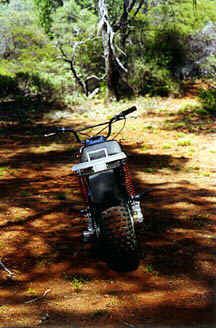 The Trailkat is the ultimate in a fun, rugged, reliable 2-Wheeled All Terrain Vehicle. Dependable Honda power makes sure you keep riding, not walking (back). Every effort has been made to make Trailkat easy to ride; There are only 2 controls --- go and stop --- so riders can concentrate on where they are going rather than what's going on. This is NOT a mini-bike. 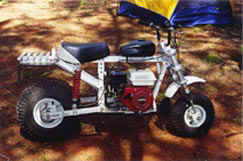 It is a true off road 2-wheel ATV; computer designed, CNC machined, and hand assembled to assure top quality. Trailkat construction is of bolted together high strength structural aluminum rod, bar and plate. No welds are used. so no matter how rough you treat it, no welds are going to break. All fasteners are aircraft quality stainless steel. Self-locking nylon lock nuts are used throughout. All threads are assembled with Loc-Tite®. Both axles and the swing arm pivot are 3/4" diameter stainless steel --- over twice as large as necessary. Pairs of automotive sealed tapered roller bearings are used on each axle. The swing arm pivot shaft rides in twin rulon bushings. The double idler sprocket has 2 sealed precision ball bearings. The primary/secondary chain drive system used on the Trailkat allows constant tension on the drive chain rather than the tight/loose found on straight counter shaft construction. The engine is a commercial Honda 6.5 HP single cylinder, overhead valve, 4-cycle unit equipped with an approved spark arrestor and has a 2 year manufacturer's warranty. The transmission is a 4:1 variable sleeve belt drive (ala sno-mobile). This means the engine is "on power" all the time and doesn't have to "spool-up" like a centrifugal clutch. Two wheel external self cleaning band brakes are standard. The 4" front suspension is "motorcycle type" internally sprung and damped cylinders. 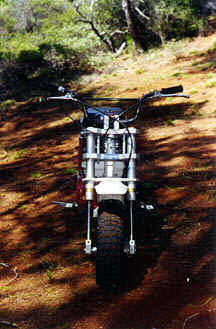 Damping can be altered by changing shock oil. The 6" travel rear suspension is a pivoted swing arm with motorcycle coil-over shocks. The Trailkat is great for camping. 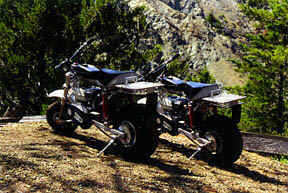 It will get you and your gear into places a normal ATV wouldn't or couldn't go. You can either load up the utility rack on the back, or backpack it. And with the almost 200 mile range of the Trailkat, you can really get "back to nature." There's nothing too steep, or too wild for the Trailkat! One of the most important advantages of the Trailkat is it's light weight. You can put it in the back of your pickup, hang it off the rear bumper of your RV, or even lay it on it's side in the family SUV. 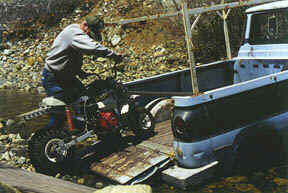 No ramps or trailers required. 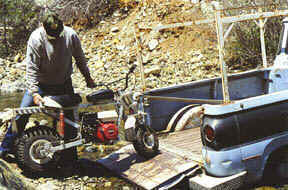 So, when you need to get into the "outdoors", the Trailkat is readily accessible. 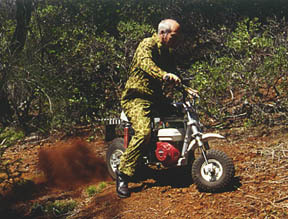 Other uses of the Trailkat are in search and rescue, forestry, herding, hunting, fishing and passenger/parts transport at vehicle races, etc. 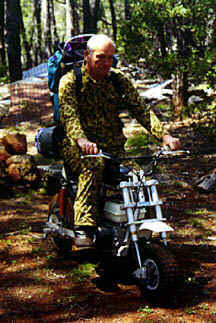 There are many other ways to use the Trailkat....and you'll have to try one just to see how great a machine it is.